[XPB-591] Our Partition Mounted Combonation Unit serves two compartments. Dispenses 1,000 standard single or half-fold paper toilet seat covers. 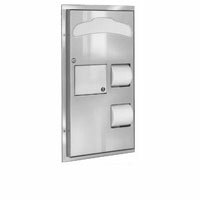 Dual roll tissue dispenser-holds four standard core rolls through 5 1/4" in diameter. Waste receptacle capacity .88 gallons. Non-controlled delivery. For shipping quotes, orders or questions please call our Customer Service Center at 1-877-483-9270.